Metal stair spindles are a great alternative to timber and glass stair parts. A staircase occupies the most prominent position in a house and is perceived by many as the main focal point of a home, so selecting the right stair spindles, and other balustrade components are of great importance. If you are searching for something affordable which looks great, are safe for all the family and require very little regarding maintenance, metal stair spindles are an excellent option. Gone are the days where you would see metal stair spindles purely in an industrial setting, they are gaining much popularity in home improvement and staircase renovation projects also. Why are metal stair spindles so popular? 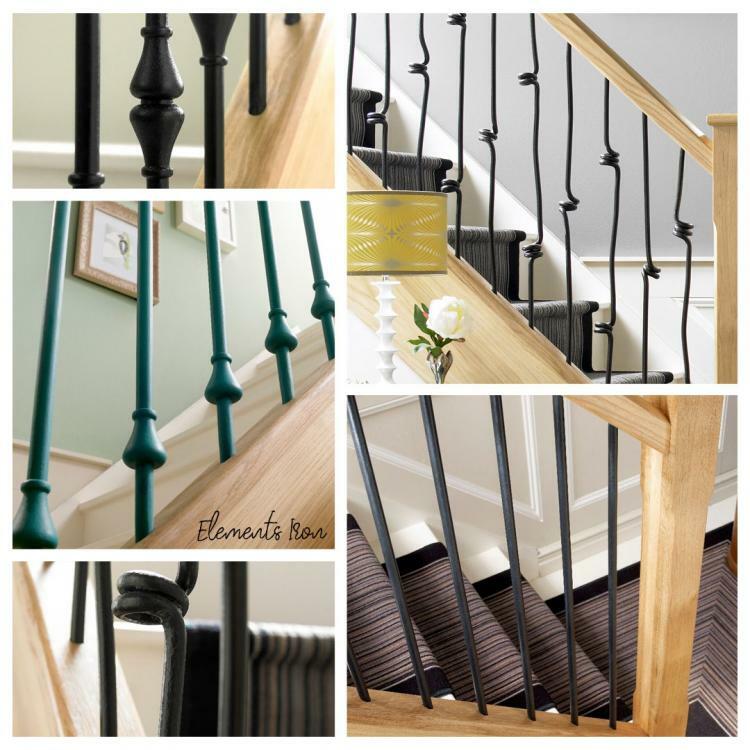 If you want the focal point in your home packed full of character and quirkiness, metal stair spindles are a perfect take on a rustic and traditional feature that will fit nicely in both a contemporary and traditional setting. They can take on a simple design such as square or rounded, or a more ornately curving design such as Elements Black Iron. They can be mixed with glass or even timber to create that real wow factor. Whether you want soft and elegant or square and hard-edged, metal stair spindles should always be your material of choice. Metal stair balustrade is built to last. Unlike timber stair parts, they are not vulnerable to changes in the environment and will not bend nor warp. Metal is tough, durable, and will last for years which makes it a great long-term investment and cost-effective option if you are in the stair renovation market. In particular, the Black Iron Balustrade system has been designed to give a modern look to your staircase without the need of fussy connecting brackets. The metal stair spindles slot into the pre-grooved handrail and base rail and are then secured using a bed of silicon that sits between the solid oak fillet strips supplied. This system can be used with any newel post in any timber - new or existing - allowing you to mix oak rails with white painted posts for example. Leaving your existing newel posts in place makes the job quick and easy, refreshing your staircase in a matter of hours. With a reduced installation time means reduced costs, sounds good right? Metal stair spindles will always win over other materials when it comes to maintenance and upkeep. If painted correctly, your spindles will not rust or fade. Staircases should have a maximum rise of 220mm, minimum going of 220mm, and a maximum pitch of 42°. These measurements are for domestic staircases only. If the staircase in question comes under the category utility or general access, these will be different. Staircase steps should all be level. If your staircase is less than one metre wide, you will need at least one handrail. Any flights over one metre will need a handrail installed on both sides. You are required to have a minimum of 2,000mm of clear headroom above the pitch line. Contemporary Square Black Iron range. Our Contemporary Square Black Iron range balances the timeless luxury of classic materials such as oak and iron with versatile modern designs to fit any home. Well-engineered and easy to install, these strong staircases can be painted and tailored to complement your existing interior. Contemporary Square is the ideal range if you are looking for a bold mix of modern and traditional style. For more information on this range, click here. Contemporary Round Black Iron range. 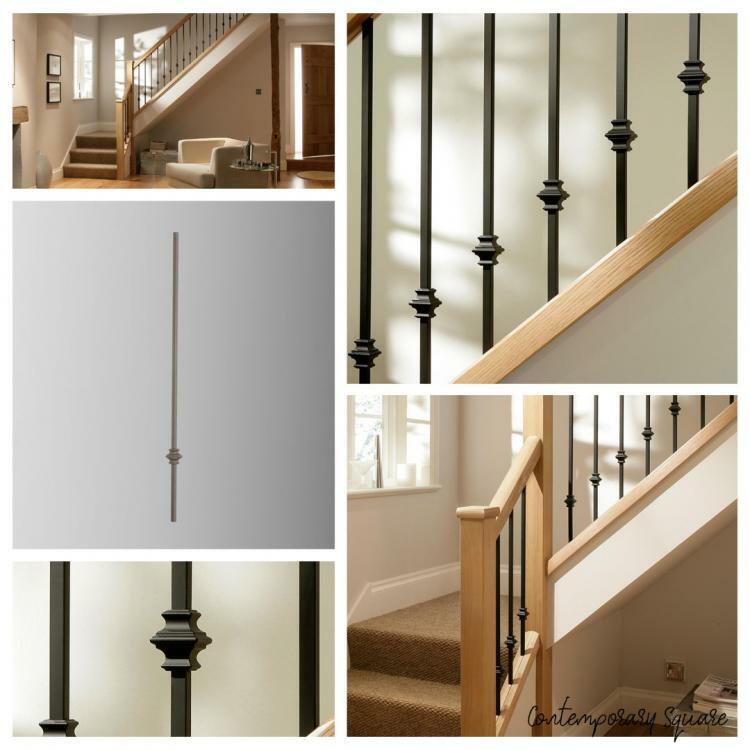 Similar to Contemporary Square, Contemporary Round Black Iron Spindles balance the timeless luxury of classic materials such as oak and iron with versatile modern designs to fit any home. We stock two styles in this range; straight and wavy. You can see examples of both styles above. For more information on this range, click here. 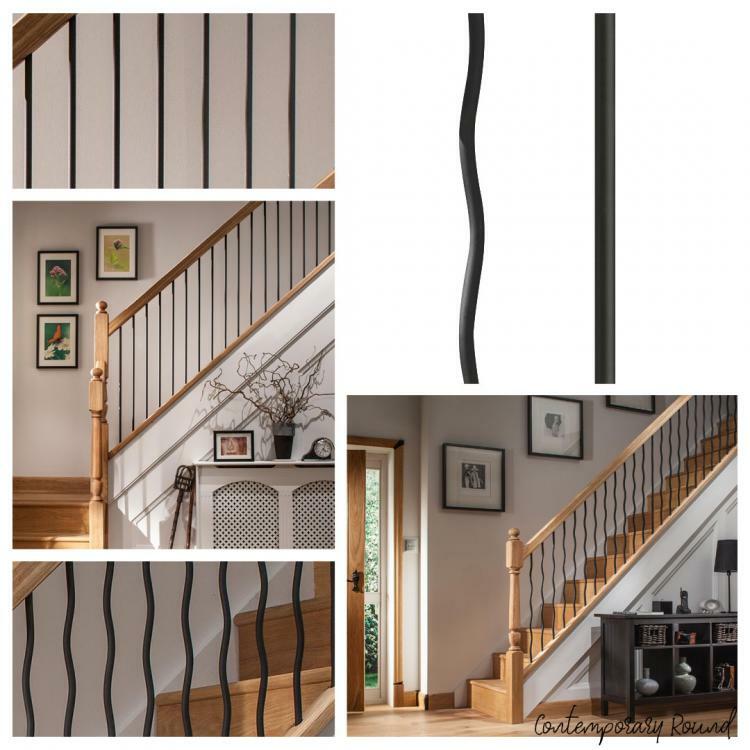 If you are looking for a mixture of old and new, then the Richard Burbidge Elements with Black Iron Baluster range is for you. 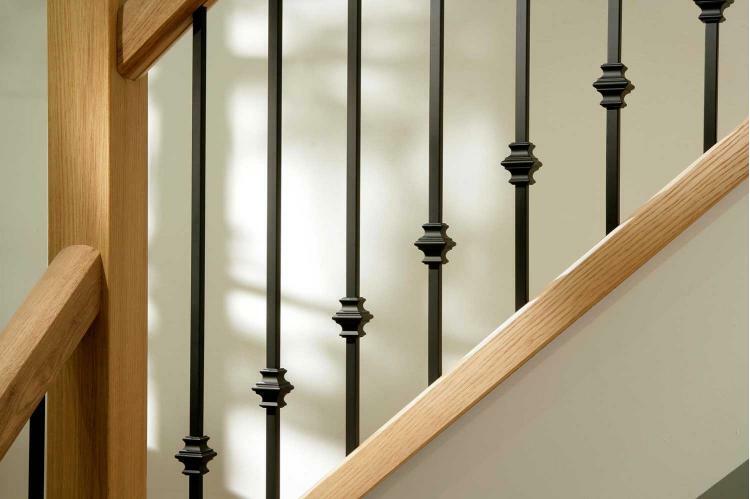 Combining White Oak Handrails, Base Rails and Newel Posts with Black Iron Metal Stair Spindles, Elements has the best of both worlds for those looking for a unique look. The Black Iron Spindles themselves are supplied in packs of 3 and are available in a choice of 6 designs ranging from plain to rather ornate. For more information on this range, click here. 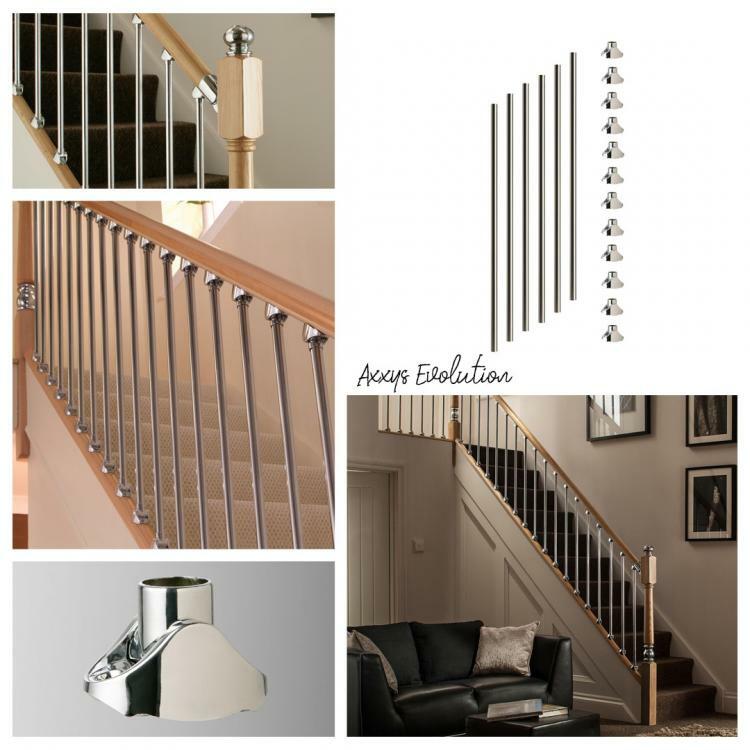 Axxys Evolution is a sleek, contemporary stair balustrade system, merging modern Chrome and Brushed Nickel Connectors with timeless, high-quality timbers. 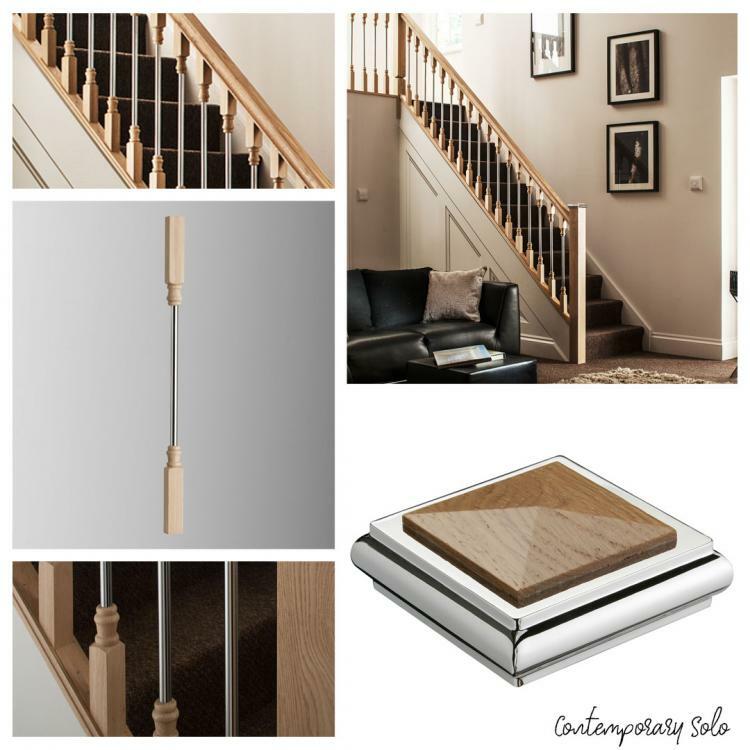 You can choose to keep your current newel posts in place and replace your rails with the Axxys Evolution range of spindles and handrail connectors or opt to revamp your whole staircase. For more information on this range, click here. The Solo range is one of a kind. The clean lines in this collection draw your eye to beautiful metallic detail which is available in either chrome or nickel. All of the stair parts included in this collection can be integrated with other Blueprint Joinery stair parts for a look that blends contemporary and traditional styles to deliver a truly unique finish. For more information on all the metal stair spindles we sell, please check out our metal and glass balustrade category area here on the Blueprint Joinery website. If you require additional help or would like someone to assist you in planning your stair renovation, please get in touch either by email (info@blueprintjoinery.co.uk) or by telephone (01691 671 020).